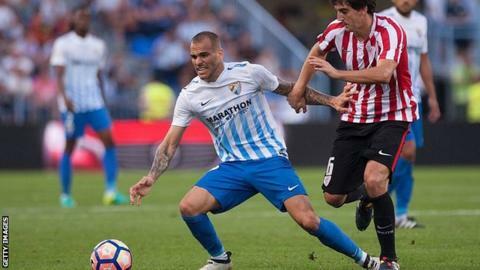 Everton are set to complete the signing of Malaga striker Sandro Ramirez after meeting his £5.2m buy-out clause. The 21-year-old scored 14 goals in La Liga last season, having joined Malaga from Barcelona in July 2016. He is currently playing for Spain Under-21s at the European Championship in Poland. Sandro had a medical on Merseyside before the Euros, and Everton are now understood to have completed the formalities. Everton have signed Sunderland goalkeeper Jordan Pickford for £25m and Ajax midfielder Davy Klaassen for £23.6m since the end of the season. Manager Ronald Koeman is also expected to pursue his interest in Burnley's England defender Michael Keane and Swansea City midfielder Gylfi Sigurdsson.